I’ve finally finished writing quizzes and answers for each chapter! If you haven’t done so already, make sure to validate your learning by going through each quiz without looking at the answers. It’s especially important that you do the practice triggers as well! I still remember when I finished reading Head First Java – I went through the entire book without writing a single line of code. Things got pretty ugly when it came time to actually write. I easily slowed my learning down by a month going this route. Don’t make the same mistake – if you’re committed to learning, it’s time to be strong, fulfill your destiny, and code! Let me know if the quizzes are too hard or too easy for you! Don’t forget that the Hall of Fame Challenge is coming after Chapter 7! 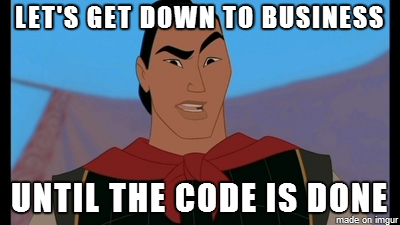 Remember guys – code don’t write itself! Anyway, back to finishing content for Chapter 6!